White-out conditions caused by strong winds were to blame for several accidents on highways around Winnipeg Thursday, including a 10-car crash on the Trans-Canada Highway in Headingley. Earlier in the day, two people were sent to hospital after a crash with a truck on Route 90. They have since been upgraded to stable. 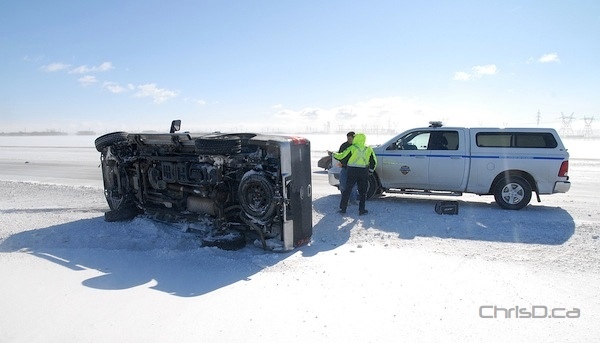 The Perimeter Highway was extremely dangerous, as vehicles crawled with their flashers on to avoid being hit. Many drivers opted to drive through the city to avoid the outskirts completely. Those who did make it safely to their destination reported near misses during their commute, expressing their warnings for others to slow down on Twitter and Facebook. Winds reached speeds of up to 70 km/h in some places, according to Environment Canada. A brief bought of snowfall by mid-morning didn’t help the conditions. Besides emergency crews, tow trucks were also out in full force rescuing motorists who had skidded off into the ditch. Friday calls for a 40 percent chance of flurries with a mix of sun and cloud a high of -2°C.